We are please to offer another officially licensed reproduction sword from the epic trilogy The Lord of the Rings. 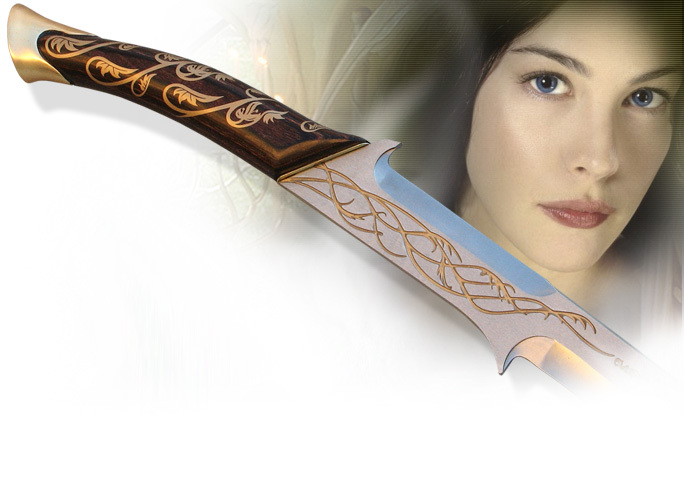 This is Hadhafang, the sword of Arwen Evenstar, the daughter of Elrond and betrothed of Aragorn. This licensed recreation measures 38 1/8" overall and offers a 30" tempered 420 stainless steel blade with sharp edge and laser etched runes. The solid wood grip is accented with metal pommel and unique vine design and is of rat-tail tang construction. Includes 15-1/8" x 4-3/8" x 3-1/4" wood display stand with silkscreened Elven design. Includes instructions and a parchment certificate of authenticity. • Overall Length: 38 1/8"
• Officially Licensed Product: This adult collectible is a licensed “Lord of the Rings” product produced by United® Cutlery. The original inscription included the last line Idril i hel en aran Gond dolen, which translates to Idril, daughter of the king of the Hidden Rock (Gondolin). It was dropped from the finished prop due to a lack of space. There is an intentional pun in the inscription the Sindarin translation of noble lady is arwen, so in effect, the blade claims to be for Arwen, even though it was made for her grandmother. Almost three thousand years the elven maiden spent in her father’s home, occasionally she visited her “always young” grandmother, Galadriel, until she met Aragorn. The king-to-be of Gondor fell in love with Arwen. For Aragorn she became that fair lady, for the sake of whom every true knight performed his deeds. In her thoughts Arwen was constantly with her beloved.